Microsoft Dynamics 365 is an integrated and cloud-based suite of business apps that aim to facilitate greater productivity and collaboration in the workplace, transform business processes enabling you to work faster and smarter than ever before and ultimately take your business growth to a whole new plain. All the CRM solutionproviders say that -what sets Dynamics 365 apart? Dynamics 365 is more than a CRM, it’s an evolution is business technology. It stands alone as the only cloud-powered platform that combines ERP and CRM bringing communication, data and reporting into a cohesive whole. So the sales guy who needs information on how many products are available in the warehouse, on what date they will be delivered and on what time he can meet the appropriate customers to discuss the sale, can do it all from one place. 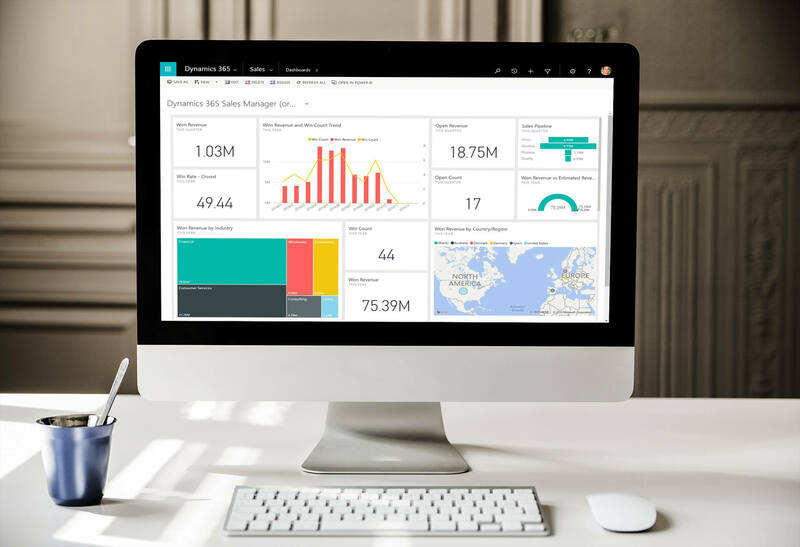 No more time wasted sending emails to different departments or wading through Excel files – get all the data on all the moving parts that drive your business altogether in Dynamics 365. So what areas of my business does Dynamics 365 cover? Sales, marketing, field service, talent management, accounting, operations, automation— just about every line of business is catered for with Dynamics 365. You can totally modernise almost every aspect of your business. And all the while you will have access to unprecedented levels of transparency, reporting and insights into your products and/or services. But we’re happy with what we’ve got, what are we missing out on? Well how about artificial intelligence – we’re not talking about the type of robots you see in sci-fi movies here but we are referring to cutting-edge artificial intelligence technologies, specifically Cortana, Microsoft’s virtual assistant; Power BI, the business intelligence app; and Azure Machine Learning. So what? That’s all jargon to me – what does it do? You can gather data that predicts your customer or business need. For example you can more accurately determine stock-taking requirements or allow for seasonal adjustments – you’ll get better data and you’ll get it quicker. You will slash your costs and streamline your operating processes. All that sounds wonderful but what about the data – is it safe? You’re always on, always protected with Dynamics 365. That’s because your data stays secure, under lock and key, in Microsoft’s network of local, state-of-the-art data-centres. Pull the plug on high maintenance costs and let Microsoft’s experts deal with cyberattacks instead so that your IT staff can focus on providing value to your business rather than fighting fires. OK I’m sold – how do we get moving on this? Who should we be working with? How about working with Microsoft country partner of the year for two of the last three years and Dynamics 365 partner of the year for five out of the last six years. These awards are Microsoft’s way of saying Codec is the best partner in Ireland, and have the experience and team to deliver the best possible results for your business. Click below for a demo now.